The PRM aerosol can is mounted in the 9016 tester and pressurized until the top dome buckles. 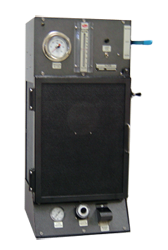 The test and failure pressures are indicated on the large, front panel gauge. The rate of air flow through the vent after the can fails can then be obtained and results are indicated on the flowmeter.